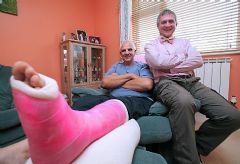 AN INJURED man has raised £150 for charity by sporting a pink plaster cast. Please click here for more information. 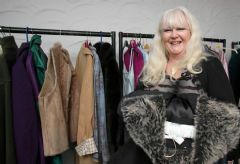 HUNDREDS of items were sold and raised about 4,500 at a packed charity sale in aid of the Pink Ladies on Saturday. Please click here for more information. 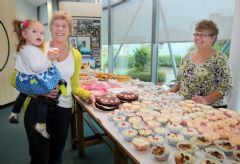 COLOURFUL cakes and fashionable clothing were on sale at Guernsey Press headquarters yesterday as part of the companys annual Pink Ladies fundraiser. Please click here for more information. A NEW charity pin badge has been launched to raise awareness and funds for a group supporting Guernsey women with breast cancer. Please click here for more information. Cupcake Superstar is on online business which sells anything to do with cupcakes and more ! Please click here for more information. 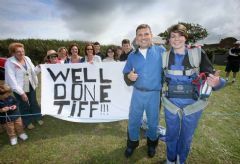 FUND-RAISERS were jumping out of planes for charity at the weekend as a visit from Skydive Jersey gave them the chance to have a once in a lifetime experience. Please click here for more information. 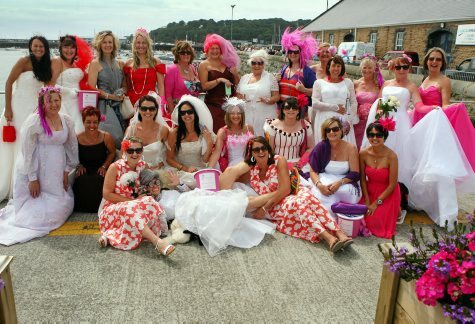 DRESSED to impress, a group of friends travelled to Herm and raised 1,200 for breast cancer support group the Pink Ladies. Please click here for more information. This beautifully designed post surgery bra is for sale at 19.50 from Marks & Spencer. 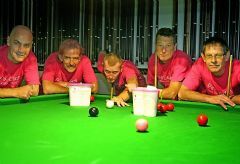 FIVE North Social Club members battled through the night to complete a 24-hour snooker marathon. 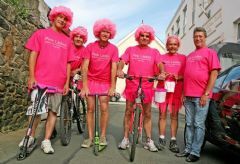 Dressed in pink, the men fought through the tiredness and muscle pain to raise money for the Pink Ladies. Please click here for more information. PINK was the theme on Saturday as five men dressed in women’s clothing and micro-scooted around the island. The North Social Club members travelled 24 and a half miles, taking it in turns to micro-scoot. It was all in aid of the Pink Ladies. Please click here for more information. Kerry Roger recently set up a new dog walking business and would like to support the Pink Ladies by making a donation for every booking made. Please click here for more information. Walking in pink for the Pink Ladies are, from the left, Danielle Bateman, Katie Latham and Leonie Pike. A range of charities benefit from last week's activities week at Les Beaucamps School thanks to year 10 students. Please click here for more information. AFTER discovering that his ex-wife had been diagnosed with breast cancer, Richard Vahey decided to have the Pink Ladies’ logo tattooed on his back to raise money for the cause. Funds raised by the 39-year-old will go to the local breast cancer support group. Please click here for more information. As part of his training for the Guernsey Marathon on Sunday 26th August, Richard ran the Father's Day Half Marathon in June. Richard finished in just over 2 hours and wore a recently created Pink Ladies vest. The Pink Ladies would like to thank Richard for his continued support and wish him the very best of luck for the marathon ! Please click here for more information. STAFF at NatWest took to two wheels to cycle their way around the island’s branches to raise money for charity. The first Guernsey ‘Tour des Branches’ was an idea copied from the bank in the Isle of Man. Please click here for more information. We would like to introduce you to C21 which is the UK’s first mainstream cancer magazine. The aim of the magazine is to bring together healthcare professionals, cancer patients, their friends and families by providing a forum where these different groups can interact with each other, to inform and support including latest developments in the cancer field and personal stories. The hope is that the magazine reaches as many people as possible and therefore the magazine is FREE. Please click here for more information. The degree to which stress influences our lives is generally underestimated: Often the mind clings on to anger, guilt, or regret about the past, or is plagued by anxiety and worry about the future. This oscillation of the mind causes tension and stress both for ourselves and for the people around us. Breath is the link between the body and the mind and is key in handling our mind and negative emotions. In order to raise awareness, we offer a series of free taster workshops for groups in Guernsey. We facilitate the workshop at your venue and it can run for between half hour to ninety minutes according to your availability. The Health and Happiness Workshop consists of a full yoga session with relaxation, breathing techniques, guided meditation and information and tips about simple ways of better handling stress and living with more health and happiness. We can also run shorter workshops which use these same elements to give participants a taste of the benefits. Previous participants have reported more energy, reduced stress, enhanced health, improved mental clarity and focus, improved sense of wellbeing and increased creativity. If you enjoyed the taster session, we offer Art of Breathing courses - see details attached Please click here for more information. When looking good means feeling better There's no doubt that looking good is a confidence booster for women and that's also true of those who have cancer. Nicci Martel discovers how an international charity's beauty workshops help to give local women a lift - and why it needs volunteers...(Guernsey Press Article 31/3/2012) Please click here for more information. Congratulations to Kim Marquis who was crowned the 2011 Specsavers Unsung Hero after receiving nearly a third of the 800 votes cast. Please click here for more information. Time to vote for your Unsung Hero of 2011 - this is a true people's choice of residents who have quietly given to their Island over the years; scouts, volunteers, carers and charity workers. Please click here for more information. A recent dressdown day raised funds for the Pink Ladies Please click here for more information.